From Middle English aumbre, in turn from Middle French ambre, from Arabic عَنْبَر‎ (ʿanbar, “ambergris”), from Middle Persian ʾmbl (ambar, “ambergris”). Compare lamber, ambergris. Displaced 古期英語 eolhsand (“elksand”). The nucleotide sequence "UAG" is named "amber" for the first person to isolate the amber mutation, California Institute of Technology graduate student Harris Bernstein, whose last name ("Bernstein") is the German word for the resin "amber". Ambre is hote and drye […] Some say that it is the sparme of a whale. As for Amber Grice, or Amber Cane, which ist most sweet myngled with other sweete thynges: some say it commeth from the rocks of the Sea. […] Some say it is gotten by a fish called Azelum, which feedeth upon Amber Grece, and dyeth, which is taken by cunnyng fishers and the belly opened, and this precious Amber found in hym. Slaves […] with silver Censors […] perfum'd the air with Amber, Aloes wood, and other Scents. Slanders, sir: for the satirical rogue says here that old men have grey beards, that their faces are wrinkled, their eyes purging thick amber and plum-tree gum and that they have a plentiful lack of wit. To shew this by example, we reade of Sabina Poppcea, to whom nothing was wanting, but shame and honestie, being extremely beloved of Nero, had the colour of her haire yellow, like Amber, which Nero esteemed much of, […] . (Britain) The intermediate light in a set of three traffic lights, which when illuminated indicates that drivers should stop short of the intersection if it is safe to do so. While earlier controllers provided concurrent ambers, present practice is to indicate a minimum intergreen period of 4 s.
Also flashing ambers are not operational at this type of crossing. >Problem: Red-red signals are too time consuming when traffic density is higher. I don't find them time consuming at all. I find them identical to ambers. (biology, genetics, biochemistry) The stop codon (nucleotide triplet) "UAG", or a mutant which has this stop codon at a premature place in its DNA sequence. For example, to cross a temperature-sensitive mutation with an amber mutation, amber suppressor cells are infected at the low (permissive) temperature. Double ambers revert at 10-8-10-9, and therefore, reversion is negligible. Double-amber mutants are made by crossing single-amber mutants with each other. Of a brownish yellow colour, like that of most amber. They all moved safely through the first green and then the second, but when the third light turned amber Jack's taxi was the last to cross the intersection. Ahead, a cool breeze swept the pale morning sun across a grassy meadow turned amber by morning's frost. (transitive, まれに) To perfume or flavour with ambergris. 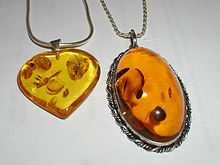 (transitive, まれに) To preserve in amber. (transitive, まれに, chiefly poetic or literary) To cause to take on the yellow colour of amber. For purple mountains majesty; for amber waves of grain. Home to the mosaic of coloured-lit windows in the black and white houses, the fake gas lamps ambering the cobbles, sometimes the scent of applewood smoke. The firelight flickered on her rounded cheeks, ambering the pale skin. (intransitive, まれに, chiefly poetic or literary) To take on the yellow colour of amber. “Amber” in David Barthelmy, Webmineral Mineralogy Database, 1997–. “amber”, in Mindat.org ‎, Hudson Institute of Mineralogy, accessed 29 August 2016. ^ James F. Crow; William F. Dove (1995), “The Amber Mutants of Phage T4”, in Genetics ‎, volume 141, issue 2, PMID 8647382, pages 439–442. ^ Nicholas Wright Gillham (2011), Genes, Chromosomes, and Disease: From Simple Traits, to Complex Traits, to Personalized Medicine. According to one theory, it is from Proto-Germanic *ambrijaz, *aimbrijaz (“bucket”), from Proto-Indo-European *ambʰor- (“tub, bucket”). If so, then cognate with Old Saxon ēmbar, Old High German ampri, eimbar, Ancient Greek ἀμφορεύς (amphoreús, “vased shaped ornament with a narrow neck”) (whence Latin amphora), Sanskrit अम्भृण (ambhṛṇá, “a vessel used in preparing Soma juice”). According to another theory, the Proto-Germanic forms derive from a compound equivalent to *ainaz (“one”) + *bariz (“that which is utilised for carrying; bar, crib”). A third theory considers the 古期英語 term to have been borrowed from Latin amphora. Compare German Eimer. AMBER (an acronym for Assisted Model Building with Energy Refinement) is a family of force fields for molecular dynamics of biomolecules originally developed by the late Peter Kollman's group at the University of California, San Francisco. AMBER is also the name for the molecular dynamics software package that simulates these force fields. It is maintained by an active collaboration between David Case at Rutgers University, Tom Cheatham at the University of Utah, Tom Darden at NIEHS, Ken Merz at Florida, Carlos Simmerling at Stony Brook University, Ray Luo at UC Irvine, and Junmei Wang at Encysive Pharmaceuticals.